After Virginia’s upset of Minnesota last night, the ACC is off to a good start in the ACC-Big Ten challenge. Will that continue tonight as the games ramp up? We also have a really good Big East/Big 12 clash on tap this evening. All rankings from RTC and all times eastern. Ohio State’s last journey to the state of Florida was a rousing success, a 93-75 shellacking of Florida in Gainesville. The Buckeyes face an opponent with a much different style, but also a team that was beat by the same Florida team that lost to Ohio State. We said this was a crucial week for Florida State and now it becomes even more important as the Seminoles are in danger of going 0-2 at home against two quality teams in a span of three days. FSU star Chris Singleton was held in check by the Gators, shooting just 2-12 on the night. Singleton must get back on track for Leonard Hamilton and his team to have any chance against Ohio State, it’s as simple as that. This game features two of the top five teams in defensive efficiency but Florida State’s offense has held them back. 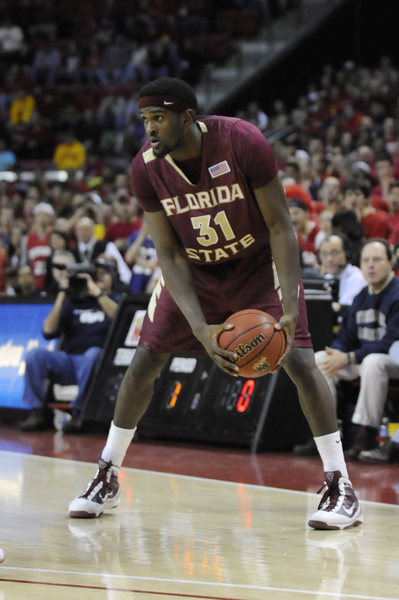 The ‘Noles rank #94 in offensive efficiency, a far cry from the Buckeyes lofty #4 perch. Florida State has to have a strong defensive game against an explosive Ohio State offense but it doesn’t stop there. A solid performance on the other side of the ball is imperative. Florida State can play all the defense it wants but they won’t win without better scoring. Michael Snaer had a great game against Florida, going 5-6 from beyond the arc. He’ll need more of that against an Ohio State perimeter that can match or better him with guys like Jon Diebler (48% from three) and David Lighty. Singleton versus Jared Sullinger in the post will be one heck of a matchup. Perhaps the best defensive player in the nation goes up against one of the best offensive post players (62% FG) and whoever gets the edge could lead their team to victory. Two key areas bear watching in this game: turnovers and rebounding, especially on the offensive end for Ohio State. The Buckeyes rank #6 in forcing turnovers while FSU is #276 averaging 18 turnovers a game. If Florida State is turning the ball over that much they can essentially forget about getting a win tonight. Ohio State is #10 in offensive rebounding percentage while the Seminoles are #187, not doing a good job on the defensive boards. Ohio State is the favorite here but it would be hard to imagine them playing so well again away from home. Florida State isn’t desperate but they are in need of a big time win. They may not get it tonight but we think they’ll come out with a strong effort and make this a very interesting game. Both teams tied for tenth in our latest RTC Top 25 released yesterday, though their playing styles could not be any more different. Missouri uses Mike Anderson’s version of “forty minutes of hell,” acquired from his time spent as an assistant under Nolan Richardson at Arkansas. The Tigers rank #16 in tempo and are second in the nation at forcing turnovers. That could be a problem for a Georgetown team that likes to play at a slower, more deliberate pace. The Hoyas average 15 turnovers per game and rank #222 in turnover percentage. Georgetown gets most of its points behind the three point line from the trio of Chris Wright, Austin Freeman and Jason Clark. All three shoot at least 45% from the arc with Freeman checking in at an astounding 58%. As a unit, Georgetown is the sixth best three point shooting team in the nation. Missouri, #196 in defending the three, is going to need its taller wing players such as 6’6 Kim English (two steals per game) to harass the Hoya shooters with his length and athleticism. Missouri as a whole is not very good at three point defense (#196), but neither are the Hoyas (#189). Marcus Denmon and Michael Dixon Jr. are Missouri’s best deep threats and will need to minimize the pain of the Georgetown three point attack by making shots of their own. Coach Anderson uses a deep bench to rotate fresh players in and out in order to keep the defensive pressure strong throughout the game. No Missouri player averages more than 26 minutes per game. While Georgetown is almost exclusively a perimeter oriented team, they’ve received good contributions from Julian Vaughn and Hollis Thompson up front, combining for 19/14 a game. Missouri holds an edge in the front court behind Ricardo Ratliffe (11/10) and Laurence Bowers (12/7). The Hoya big men need to rebound the ball effectively against a solid Missouri front line that will stay fresh with two other contributors coming off the bench for Anderson. Georgetown is going to need something good off the bench from a few other players in order to keep their starters fresh against the relentless Mizzou pressure. This should be a tremendous basketball game and whoever holds the edge in three point shooting or rebounding should come out on top. Expect a forty minute battle with the outcome not determined until very late. The Tar Heels escaped the College of Charleston on Sunday and now have a quick turnaround on the road against a very good Illinois squad in a rematch of the 2005 NCAA title game. The story for Roy Williams has been the lackluster play he’s received from his guards. UNC is averaging 16 turnovers per game and the offense is not clicking as it should be. That’s due to point guard play and also the struggles of freshman Harrison Barnes. Barnes was supposed to be the savior this year for North Carolina. He may still be in the end, but right now he’s mired in shooting slump. Including his 0-12 performance in a loss to Minnesota, Barnes is shooting just 25% (12-48) from the floor and 21% from three over his last four games. A healthy Tyler Zeller (16/8) and John Henson (10/11) have been bright spots for Williams but the team seems to lack a true leader. Illinois has that in Demetri McCamey. The senior point guard is playing the best basketball of his career in Champaign, averaging 15 points and eight assists per contest while shooting 48% from three. Illinois’ top three scorers are guards and they’ll hold a significant advantage over UNC in that area. Mike Davis and Mike Tisdale are averaging 21/14 combined but they lack the assertiveness needed to really dominate the game. Bruce Weber would never say he’s been disappointed with their play over their Illinois careers but we’re sure he’d love to see them acquire a more aggressive attitude on offense. They’re going to need to stay out of foul trouble against Zeller and Henson as Weber won’t have many good options to turn to. The first will be Meyers Leonard, a promising freshman who’s clocked 12 minutes per game. Leonard is very talented but has seemed a bit tentative and his lack of experience will hurt him against a solid UNC front court. Illinois is the favorite at home and is regarded as the better team, but don’t expect North Carolina to go quietly here. The Heels have an advantage inside and if they could just get some quality guard play they’ll be right in this game. Getting Barnes back on track obviously helps, too. The Orange Krush will surely be juiced up for this game and Illinois should win, but it’s not the cakewalk some are making it out to be. The Yellow Jackets have played better since the loss to Kennesaw State. They gave Syracuse a good game on Saturday in Atlantic City and really could use a solid win away from home. This is a key game for Northwestern as it is their last chance to pick up a good win out of conference. The schedule is full of cupcakes from here on out. John Shurna is averaging 23 points per game for the Wildcats while Brian Oliver is coming off a 32-point game against Syracuse. The Hurricanes were embarrassed at Rutgers on November 21 but have won two straight since. This is a big week for Frank Haith’s team as West Virginia comes to town on Saturday. Getting at least a split is necessary if Miami wants to be even near the NCAA conversation. The Rebels have decent wins over Murray State and Penn State, both at home, and need a good road win. This is their only opportunity to do so outside of SEC play. Michigan has really struggled offensively and is coming off two losses at the Legends Classic in Atlantic City. Beating Clemson would be a surprise but the Wolverines did give Syracuse a run for their money on Friday. Clemson is a bucket away from being undefeated, dropping a 61-60 heartbreaker to Old Dominion nine days ago in the Virgin Islands. Brad Brownell’s Tigers rebounded with a gutty overtime win over Seton Hall the next day, a game in which they shot 29% from the floor. This is the beginning of a key three game stretch for Clemson, with games at in-state rival South Carolina and their ACC opener at Florida State to follow. This entry was posted on Tuesday, November 30th, 2010 at 11:32 am by Brian Otskey	and is filed under Regular Features, set your dvr. Tagged: acc-big 10 challenge, austin freeman, brad brownell, brian oliver, bruce weber, chris singleton, chris wright, clemson, david lighty, demetri mccamey, florida state, frank haith, georgetown, georgia tech, harrison barnes, hollis thompson, illinois, jared sullinger, jason clark, john henson, john shurna, jon diebler, julian vaughn, kim english, laurence bowers, leonard hamilton, marcus denmon, meyers leonard, miami, michael dixon jr, michael snaer, michigan, mike anderson, mike davis, mike tisdale, mississippi, missouri, north carolina, northwestern, ohio state, Ricardo Ratliffe, roy williams, tyler zeller. You can follow any responses to this entry through the RSS 2.0 feed. You can leave a response, or trackback from your own site.